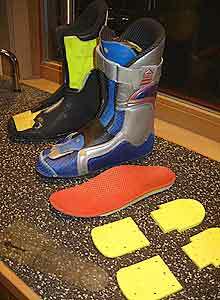 some of the components of a total custom solution: external riser plates; the all-important footbed; a custom inner boot. 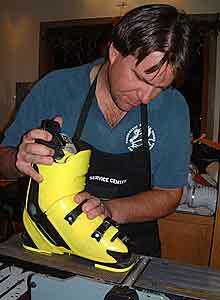 do BOOTech's "Smarter Ski Boots" cost? Comprehensive evaluation of lower kinetic chain bio-mechanics,utilizing digital pressure analysis, ROM, and determine optimal alignment, basic boot set-up, product selection,etc. Generally a one-time fee, information retained for subsequent visits. Conform'able insoles built to your specific needs. Will generally outlast 2-3 pairs of boots. Someone who purchases our full range of services Assessment, Orthotics, and has their boots canted and lifted would spend $410.00. To put this into context you need to keep in mind the value and the immediate impact on your skiing that this technology can provide. If you are someone who is facing significant alignment issues no amount of ski lessons or practice can get you to the next step. The most effective way to change the way you ski is by changing the way you stand on your skis. Smarter ski boots aren’t just comfortable, they truly “fit” your whole body and your potential for movement. They really can produce the change you’ve been looking for in your skiing. all contents © 2009-2013 BOOTech, Inc.